As far as Clara is concerned, she has failed her mission. Not just an ordinary mission, but her purpose in life. She did not follow through with the visions she has had more than a year and save Christian from the fire. Turns out Christian didn't need saving. Now, Clara is experiencing a different vision...a funeral scene. Who in her life will die and is it a result of her choosing to save her human boyfriend Tucker from the fire and not her heavenly match Christian? Some of you may know that I am no fan of the angel books (I've been burned too many times), BUT this series is an exception. 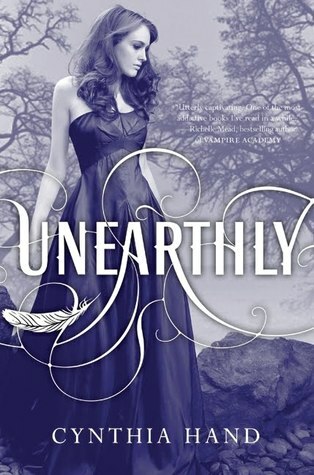 I was a huge fan of Unearthly (review here) and was chomping at the bit to read book two. Hallowed picks up just days after the fire scene where Clara fails her purpose and is dragged to Hell for a hot minute by a black wing. To be better prepared for the dark wings imminent return, the young angels form a club and try to find the answers that no one is willing to give. They find answers all right! I was surprised at how much information we learn. Turns out one angel is holding out and knows more than they are saying. Secrets....gotta love the tension! Clara learns a great deal about her family and other angels. Things that change absolutely everything about who Clara thinks she is. Yes, she solves some daddy issues too. Oh, that brother of Clara's is up to something. Jeremy is on a roller coaster of emotions throughout the entire book and he is fixing to break. The two don't seem to lean on each other like they did in the past. I think Clara is starting to get the feeling that Jeremy is hiding something. Sweet Tucker is around and we get to know him better too. Poor guy tries his best to wrap his head around this whole angel thing and is understanding. This book has a more mature feel to it. We really get to see the loving and selflessness Clara. She is consumed with fear over losing someone and when she learns the truth of her vision, she goes into caregiver mode. Clara is a terrific character with depth. It has been interesting to see her go from a scared and confused girl to a more confidant young lady. It is also fun to watch her form a deeper friendship with Christian. He is closer to her than anyone else, and although she would like to deny this fact, their heavenly roots say otherwise. Clara continues to be a strong and smart girl, and when the time comes to get down and dirty, she does. Luckily, she has a whole lot of angels to back her up. Oh, and one stinkin' cute cowboy! Get your tissues out, kids, you'll need them.